Thanksgiving is here again, and we at the Chicago Botanic Garden are thankful for all the pollinators who make our food possible, every day, around the world. Bats, bees, butterflies, birds, and more pollinate plants that create one-third of the food we eat. Click here to download the PDF (11″x17″) of this placemat. As you enjoy a meal with friends and family, take a moment to say thanks for the little things that make such a big difference—pollinators! Instructions: Click on the image above to download our placemat to enjoy with your feast. The ideal printing size is tabloid (11 x 17 inches). Letter size paper (8.5 x 11 inches) will also work if you choose “fit to page” when printing. Draw and color the foods you are eating on our placemat. Check the answer key to see who pollinated them. 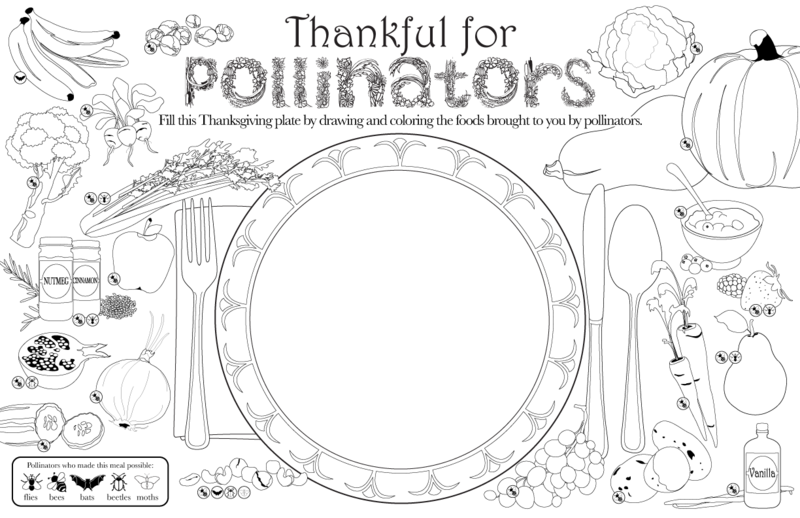 Then, fill the Thanksgiving plate by drawing and coloring the foods—fruits, vegetables, and spices—that were brought to you by pollinators. Finished spicy holiday cards smell absolutely fantastic. Work over a large paper towel or mat, because this project is messy! Fold a piece of stiff paper (construction paper or card stock) in half. Draw a design with glue on the front of the card. Try to use glue sparingly, because the paper will warp if the glue is too thick or wet. Sprinkle the herbs or spices of your choice on the wet glue. You can apply the spices by gently tapping them out of the jar onto the page, or take small pinches and apply them where you want them to go. If you want more control, fold a small piece of paper in half, put some spices in the crease, and gently tap the paper to slide the spices down the crease to apply them to your picture. It helps if you make the glue design for one spice at a time, and let each spice dry before putting a new one on. When each spice has dried, shake the card to remove excess, and apply glue for the next spice. This reduces blending. 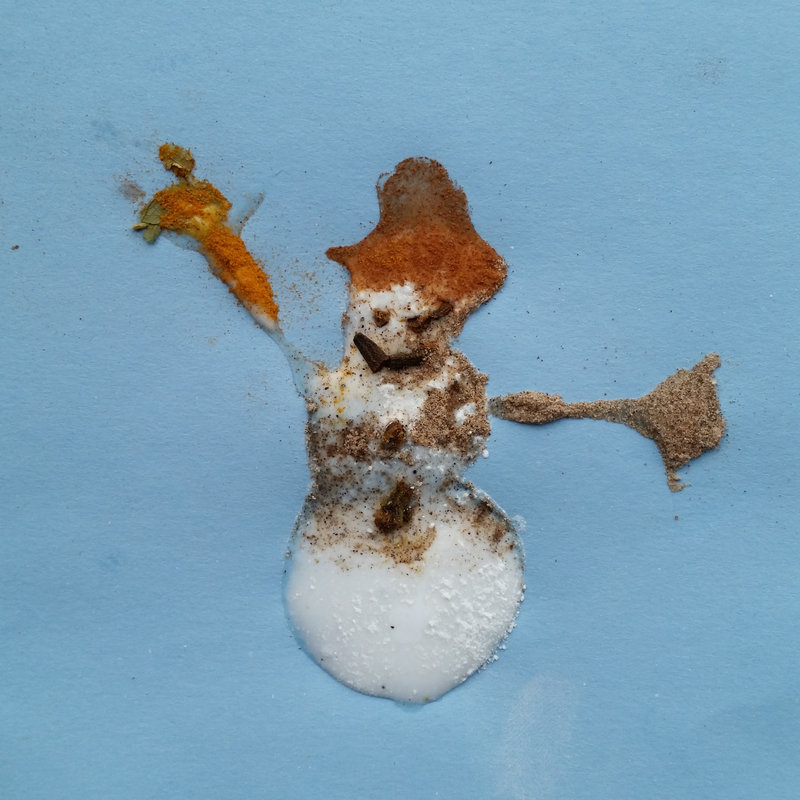 Cream of tartar dries white to make this snowman. Other dried spices were used for hat and arms, and whole cloves make the face and buttons. 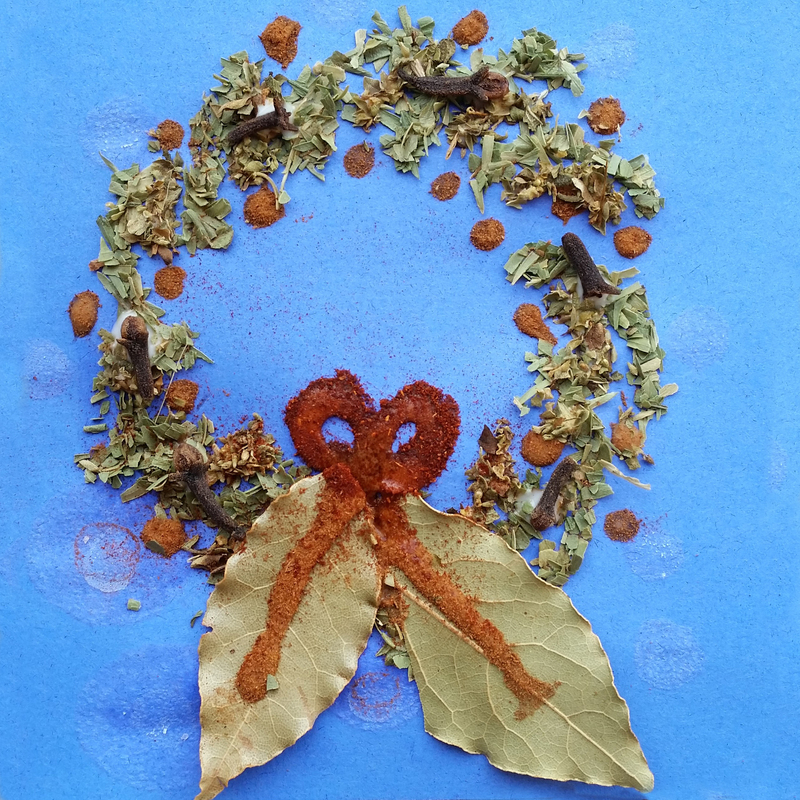 One of my daughters combined different herbs to make this wreath, and decorated it with dots of cinnamon, whole cloves, and a bay leaf and paprika bow. Dried herbs are all slightly different shades of green. Tarragon leaves are a lighter green, and a little brighter than oregano. For yellow, try ground turmeric or curry. Paprika, cinnamon, chili powder, and crushed red pepper flakes deliver warm reds. Pink and green peppercorns make nice accents. Cream of tartar and alum powder dry white, but require special handling or they will flake off. Everything sticks better if you gently press the herbs into the glue. 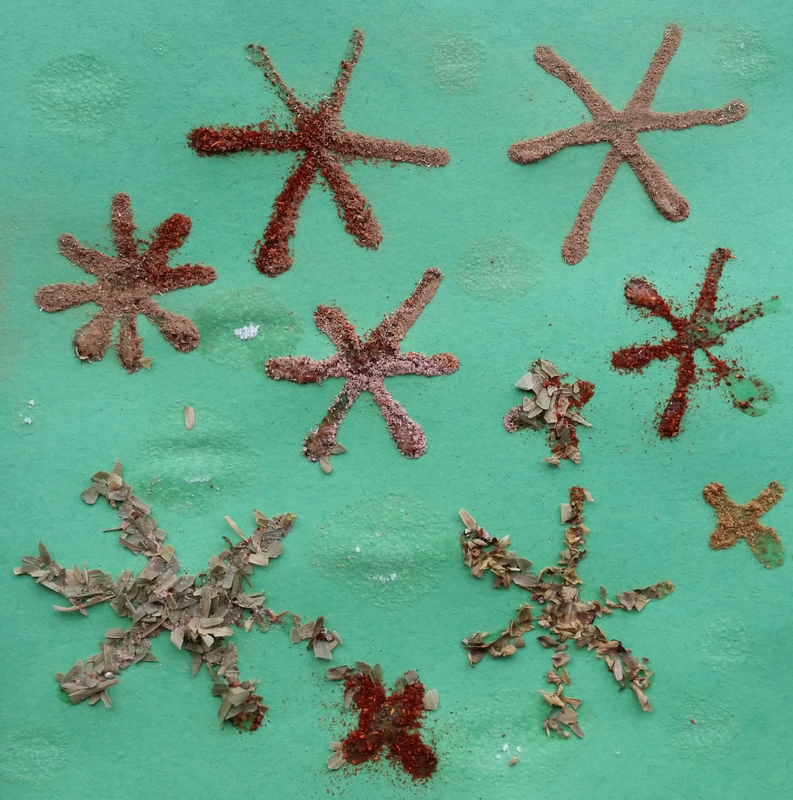 You can also glue whole spices such as bay leaves, cloves, fennel seed, or pieces of cinnamon bark to the card. Keep in mind that whole spices will make the card bulkier and may make it difficult to fit the card into the envelope. 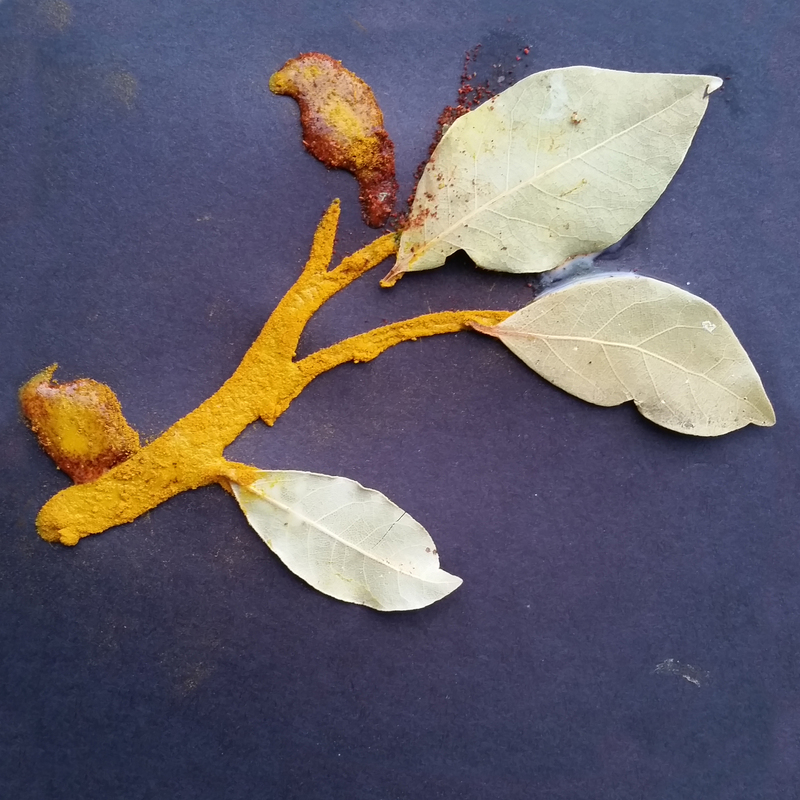 Turmeric, paprika, and bay leaves were used to create this scene of birds perched on a branch. It’s too bad your screen is not “scratch and sniff,” because this card smells of cinnamon, cardamom, paprika, oregano, and tarragon. Want to add some sparkle? Glue salt crystals in some areas or paint salt water on the paper with a fine paintbrush or cotton swab. Like glue, you’ll want to use a light touch so the paper does not become too wet and wrinkled. My daughters are teenagers, so they made an effort to make a picture of something recognizable. If you have younger children, they will probably make a picture that resembles abstract art. It doesn’t matter, because it will still smell wonderful! What’s important is that they make it themselves and have fun doing it. 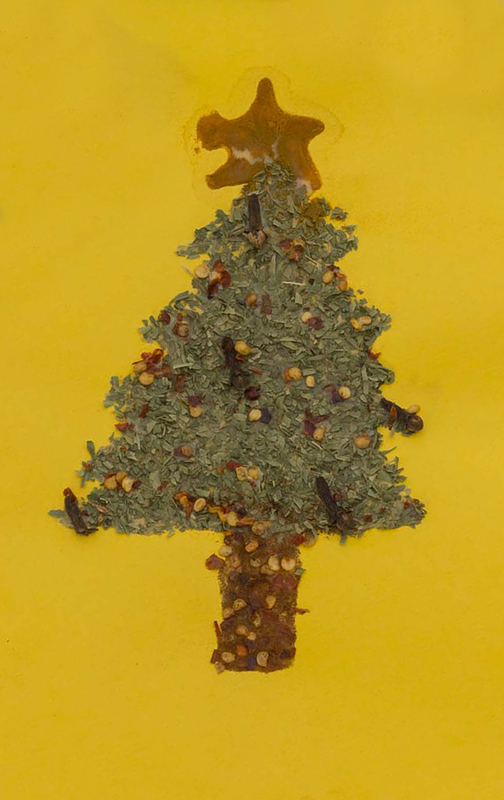 My daughter used tarragon for the tree, crushed red pepper for the trunk and garland, whole cloves for ornaments, and turmeric to make the star. After the glue is completely dry, gently shake the card over a bowl one final time to remove the loose spices. When you are finished working on this project, you can place all of the leftover spices from your work area into a bowl and place them in a room to make the air fragrant. One final step: don’t forget to write your message on the inside! You might say something clever like, “Seasoning’s Greetings,” “Merry Christmas Thyme,” “Have a Scent-sational Hanukkah,” or “Wishing You a Spicy New Year.” Don’t forget to sign your name! A card like this does not fit into an envelope easily and is best hand-delivered. If you must mail it, cover the front with a piece of paper to protect it. Carefully pack the card with a stiff piece of cardboard in a padded envelope to reduce bending and crushing while it’s in transit. If you are delivering a small bundle to the post office, ask them to hand-cancel your cards (they’ll appreciate the tip). I hope your special creations brighten someone’s day and fill them with memories of good times with family and friends! 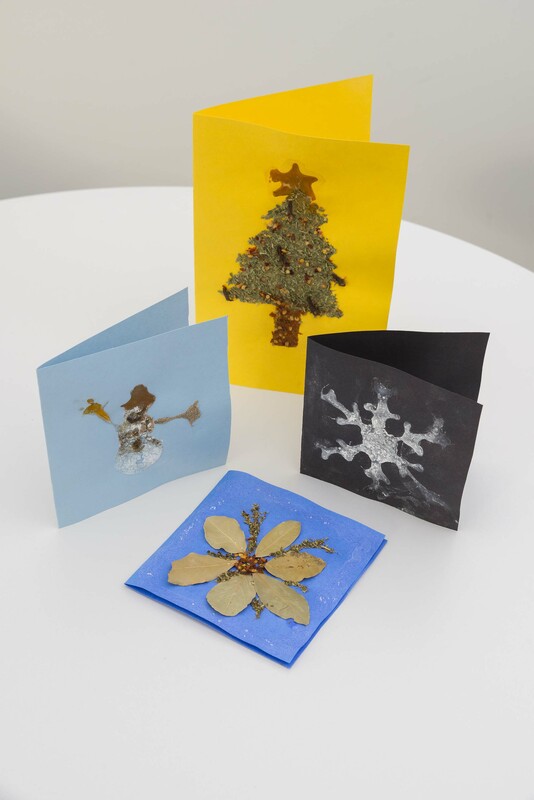 Want more fun, craft projects for kids over the holidays? Check out our blogs on making Fruit and Veggie Prints, Wearable Indian Corn necklaces, and Bottle Cap Bouquets.